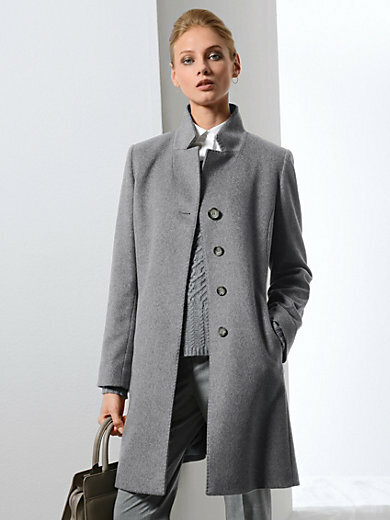 Short coat by FADENMEISTER BERLIN: elegant, impressive and feminine! Luxury class coat fashion! Elegant drape and a soft feel make this precious cashmere cloth stand out. It is produced by a small Italian textile manufacturer, with masterly skill down to the smallest details in creating the finest, exquisite fabrics. The contouring is modern and yet timeless, with elaborately fashioned revers collar, 2 pockets integrated into the side seams and concealed button band with one visible outer button. The unpretentious contouring is subtly emphasised by fine seams in a hand stitched look. 100% cashmere. Lining 100% viscose. Length approx. 35ins. The coat should be dry cleaned.